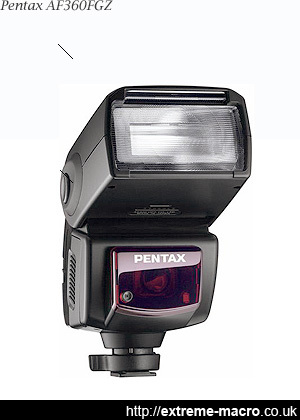 The Pentax AF360FGZ flash is Pentax' intermediate flash unit, has a guide number of 36, takes four AA size batteries and is compatible with all Pentax digital SLR cameras. The AF360FGZ has PTTL auto, PTTL front sync, PTTL rear sync, TTL auto, auto flash and manual modes, measures 70 x 110 x 115mm and weighs 270g without batteries. At the time of writing the Pentax AF360FGZ flash retails for about £200. For extreme macro in the field and the studio, the Pentax AF360FGZ flash is a bit rubbish. The most annoying thing about using this flash for extreme macro is that it doesn't remember your last state when switched off and on (e.g. mode, zoom, power etc). This combined with an auto timeout that cannot be switched off on PC-Sync after 1 minute if not used is more than enough to drive any macro field photographer absolutely bonkers. For extreme macro in the field and the studio, the Pentax AF360FGZ flash is not ideal. The most annoying thing about using this flash for extreme macro is that it doesn't remember your last state when switched off and on (e.g. mode, zoom, power etc). This combined with an auto timeout on PC-Sync after 1 minute if not used and which cannot be switched off really is more than enough to drive any macro field photographer quite bonkers. The Pentax AF360FGZ has manual settings which range from 1/1 to 1/32, but for extreme macro I personally use 1/64 and 1/128 all the time and the Pentax AF360FGZ lacks anything beyond 1/32. The Pentax AF360FGZ also just cannot cope with a manual flash pop with rear sync, this is beyond its limited vocabulary. The Pentax AF360FGZ has a horribly fiddly selection wheel, much cheaper than the Pentax AF540FGZ. It is difficult to turn and slows you down in the field. It also jumps between settings, similar to the random settings dial issue that also affects Pentax digital cameras, possibly due to poor parts. The antiquity of the Pentax AF360FGZ flash is perfectly obvious when you consider that it has no dedicated digital mode but does have 35mm and 67/645 formats. There is also no way to update any of its functions with firmware which in this price range is a fairly standard. On the upside, operating this unit remotely triggered by my Metz 58 AF-2 is easy (don't use slave, just trigger via IR), and in remote operation the unit works flawlessly. Until, of course, one minute elapses between various test shots, at which point the timeout helpfully kicks in and I have to reset the thing. As you can tell I really enjoy this feature. The Pentax AF360FGZ is flimsy and uses the cheapest of parts. The plastic foot is poorly sized and difficult to seat easily on cold or hot shoes, and the battery door does not fit tight and users report that it often breaks. Repairs on all these defects are expensive, about £100 on a £200 flash unit. It annoys me that Pentax put out a unit like the Pentax 360 with this timeout limitation in it. This feature is archaic and imaging companies really should offer better. The Pentax AF360FGZ might be ok as a first consumer upgrade to the onboard flash on its DSLRs but beyond that, as an extreme macro tool, there really are far better value for money 3rd party models out there made by YongNuo, Vivitar or Metz.